I'm excited! Been growing trophy size trout for about a decade now shipped whole frozen for a taxidermy market grown in a flow through borehole fed pond. Was purchasing 6 to 8 inch fish and feeding them until harvest -- mostly by hook and line. No shortage of volunteers! Anyway I'm tired of driving 4 or more hour long round trips to get the fish. I also get a lot of calls for tiger trout which my supplier wasn't intersted in producing. An egg source that will ship live eggs overnight has tiger trout eggs along with rainbow, brown, and brooks. Interestingly they are available as diploid or triploid. Hatched trout eggs years ago in college. This will allow me to say I hatch all the species I sell. One of my trophy brooks. Only a three year old fish. Not the biggest. Biggest wasn't as brood but just under 24 inches as a three year old fish. Will you be using McDonald Jar or Heath Tray? Making triploids is easy with a pressure shocker chamber. We do it with local Rainbow Trout producer and will repeat as part of a hatchery course in a couple of months. Triploids to grow faster once cohort reaches breeding size. Probably a jar but may make my own out of 2 liter softdrink bottles just for the fun of it. I have an old fish culturist journal from the AFS that shows how. I love building stuff myself. Sometimes it even works better than off the shelf equipment. It may be easy to produce triploids out of a pressure shocker chamber, but the price of one is out of my league. I suppose I could have one built if I wanted to. But I'm purchasing the eggs so it's irrelavent. I'm going with the diploids as I may have to rear them in the earthen flow through pond the first cycle as I might not have my partial recirc competely on line. My understanding is the triploids are a tad more sensitive to oxygen issues due to their fewer red blood cells. And my taxidermy customers want to see those secondary sexual characteristics as in kypes and body shape changes. My thinking is that may be subdued in triplods? My first challenge for the incubator and PRAS will be deciding how I want to filter out the iron: purchase an expensive dual iron filter or go with a DIY unit. I think I can handle the latter as I've already built a simple filter that gives me a few hundred gallons of gin clear iron free make up water per day for my warmwater ras. The husbandry specs start to go over my head, but that is the biggest brookie I have ever seen. Are you sure there isn't dino-DNA mixed in there someplace? It's all about the water right? The flow through pond has excellent water quality and never rises above 60 degrees during the hottest part of the summer except for the top 2 or 3 inches which maxes out at 62 F. Ground water running in is 51.6 F. Water is well aerated too. That said the feed was a little over the top on carbs and the fish have a lot of viseral fat. This even feeding them half the recommended rate. Even though all kinds of trout grow out to monster size in this pond and they are profitable to sell, I want to use a lot less ground water to do so and it appears a coldwater partial recirculating system should be the way to go. Worst case scenario if the tanks don't work out I can hatch them in my basement and plant them in the pond in the spring. 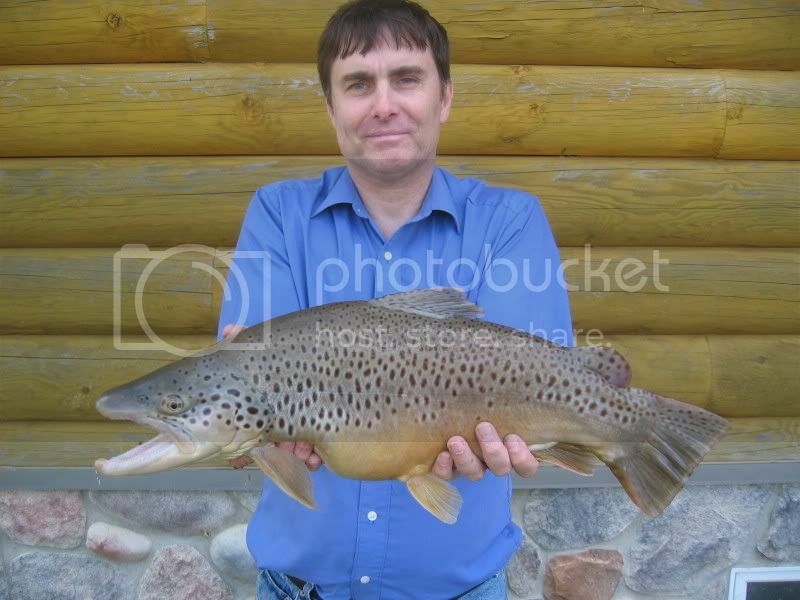 Here is one of the browns I grew out. I've grown them to 12 lbs. Coloration needs improvement. I can help with that. I assume you are referring to using astaxanthin in the feed? Been there done that but from now on have to mix it in myself. The feed manufacturer that did it for me is out of business and the others have a minimum order of a couple of tons. Way over my needs. I do it much more cheaply where probably a $20 purchase will cover the better part of a year. You scale is too small to justify the premix. Mixing still involved. I use it for broodfish where standard commerical trout feed is the base that otherwise does not give good color. Your fish have good finnage. How much do you add? I know ordering astaxanthin is not difficult. I will have to mix anyway. Zeiglers would sell me less premixed feed if I waited until they did a run for a bigger customer. Only problem is shipping vIa UPS or FedEx is outrageous even with an account I have with UPS. With record low fuel prices they're still charging me fuel surcharges! Shipping is more than the bag of feed! I have a text that says paprika coated feed will enhance reds in brook trout. Ever heard that? The good fins I believe are due to plenty of space in the pond to prevent fin nipping. I'm hoping if I keep density in the tank(s) low (under 0.25 lbs. per gallon), a good centrepital flow going, and feed well, distributed by hand feeding, I won't have issues. My taxidermy market frowns on bad fins. I use the paprika you buy as Sam's Club. Generally we mix into a gelatanized feed that even wild fish will eat. Inclusion rate is 5 to 10% by weight although half the lower will probably work. You can make into dough balls also or top coat feed with an oil and paprika mix. Our male bluegill males get orange chicks and redspotted sunfish get actual red spots like they are supposed to. I use the stuff chickens as well which I think helps hatch rate and post hatch vitality. So you use paprika and not astaxanthin? Yes. Sunfish appear able to convert the red into oranges and yellows just fine. Edited by T-Trueman. Do you think it's possible to have good fins on trout in circular tanks if I keep the density low? Or will it be a lost cause? Keeping density low only part of problem. Alternate flow direction as well to prevent asymmetry from showing. I can tell at a glance rotation direction by looking at pectoral fins of fish from the tank. Also put structures in the tank that promote contrasting areas of turbulence that fish can stack up around especially when resting. Keep dissolved organics and suspended solids as low as possible as well. This is all for not if fish bite each other a lot. Shucks maybe I will hatch my own but stick to the earthen pond for grow out. It would be a shame if the fins look like crap and my sales plummet. 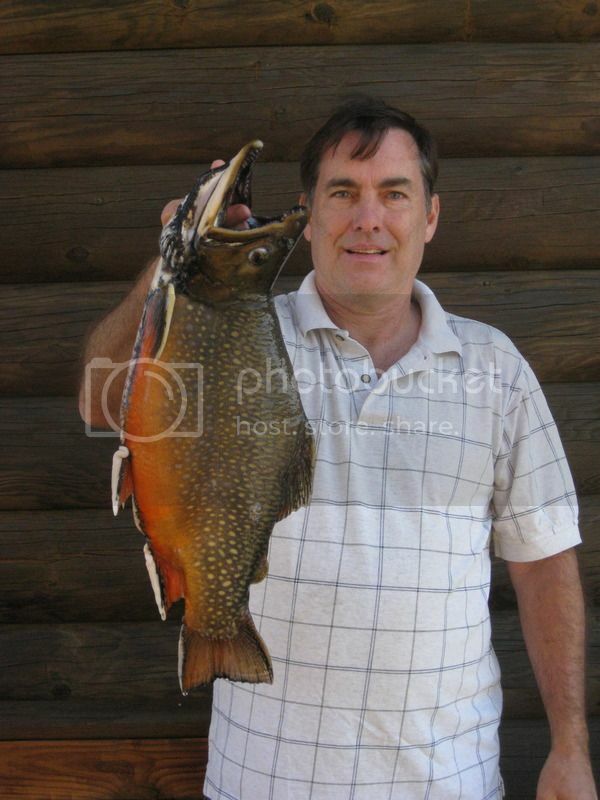 I get up to $100 each for large brook trout with good fins. Perhaps I don't need the flow I am using and can get by with less. Or come up with some way to recycle water in the pond. What do you get for premium Bluegiil, Largemouth Bass and Smallmouth Bass? Have you been selling to Bass Pro for their needs to stock display tanks? 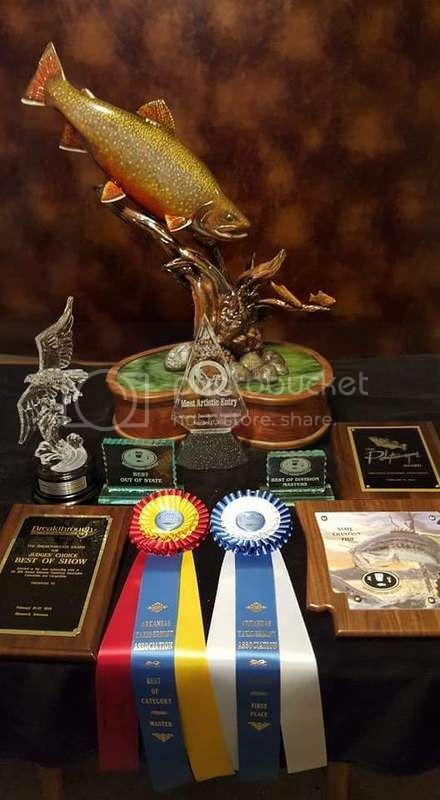 Have you been working with Coppernose Bluegill and Redear? A mounted specimen only needs one good pectoral fin, right? Bluegill minimum of $40.00 per which includes shipping of about $10.00. It goes up depending on the size and condition. I rarely sell anything under a pound or 10 inches. My bluegills are over a pound at 10 inches. Stopped rearing largemouth, as even with feed trained fish it takes too long to grow out the 6 lb. plus fish that are most in demand. Fast growth to 2 1/2 to 3 lbs. and then they significantly slow down in growth. Attrition gets higher and higher once they reach 4 1/2 pounds. I suspect too many carbs in the Aquamaxfeed I was feeding them as there was lots of viseral fat and fatty livers. Aquamax is designed for fast growth for market but apparently not a long term diet. Stopped rearing smallmouth bass due to the ease of anglers and taxidermists acquiring large specimens via angling in the Great Lakes, TVA lakes, some river systems and various reservoirs. Only so many ponds and need to prioritize. Same reason I don't rear rainbows. Too east to acquire in large sizes. Technically yes for a wall mount fish but for the prices my taxidermist customers pay they frown on bad fins etc. Not all fish mounts are wall mounts though, and some are designed to be viewed 360 degrees. There is no visible seam on a 360 mount. Here are some 360 degree mounts from fish I sold to this taxidermist (Mickey Bowman) in Oklahoma. If you make any of those hatching jars, I'd love a write-up!